Jay Martin is a technical writer, Mission resident, and MissionLocal member. A close look at Crowdpac’s website and Twitter account casts doubt on Crowdpac’s claims. In subtle and obvious ways, Crowdpac is sending a message instead of staying nonpartisan. The most obvious example is the prominence given to the candidate endorsements of Ron Conway. Conway’s endorsements appear on every candidate’s page as “endorsed by” or “not endorsed by.” Only two other people and 11 groups are given the same prominence, joining Conway in Crowdpac’s key 14. A note explains, “These key leaders and groups hold a wide range of political stances.” However, almost any 14 leaders and groups, chosen at random, would “hold a wide range of political stances.” Why were those specific 14 chosen? No explanation of the criteria is provided on Crowdpac. For the record, the two other people in Crowdpac’s key 14 are Dianne Feinstein and Gavin Newsom, which means that Crowdpac considers it more important for voters to see the endorsement of former mayors than the endorsement of the current mayor, Ed Lee. The groups in Crowdpac’s key 14 are the Harvey Milk LGBT Democratic Club, San Francisco Alliance for Jobs and Sustainable Growth, San Francisco Democratic Party, San Francisco Green Party, San Francisco Labor Council, San Francisco Latino Democratic Club, San Francisco Moderates, San Francisco Tech Democrats, San Francisco Tenants Union, San Francisco Women’s Political Committee, and San Francisco Young Democrats. The group names appear on the candidate’s pages as simple text, not linked to a full slate of endorsements or any information about the group, as users expect on an interactive website like Crowdpac. It is unlikely to be a mistake when a company like Crowdpac makes data difficult to find. Crowdpac is a well-funded company of data experts, “putting informative political data in our users’ hands,” as it says on Crowdpac’s About page. They know how to provide data, when they want to. The candidate endorsements from most individuals and groups are difficult to find on Crowdpac. On a candidate page, a user might expect a link to See More Endorsements, following the endorsements from Crowdpac’s key 14, but no link is there. The website has only one link to a page of all individuals and groups, if the user can remember where the link is. 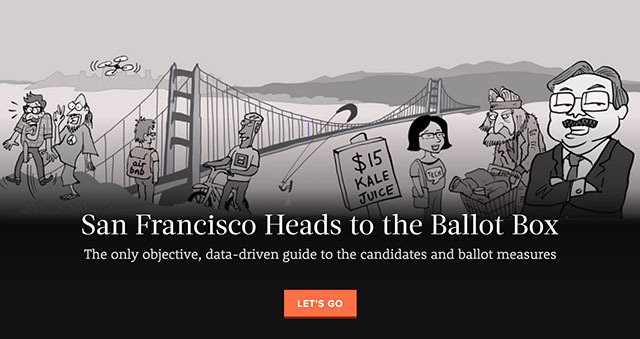 (Starting from a candidate page, a user goes back the San Francisco Election page and clicks the See All link.) Then the user searches among individuals and groups, which are not in alphabetical order, and clicks an individual or group, finally seeing candidate endorsements. To see the candidate endorsements of five or ten groups, the user opens five or ten pages. For the data experts at Crowdpac, it would be simple to provide an interactive table of endorsements, with candidates across the top, and with people and organizations down the side. (The people and organizations would probably be arranged from more liberal to more conservative, an assessment that Crowdpac specializes in.) Instead, candidate endorsements are difficult to find on Crowdpac, except for the candidate endorsements from Crowdpac’s key 14, including Conway. The website doesn’t explain Conway’s connection to Crowdpac. Instead, the website emphasizes that Crowdpac is independent. The closest Crowdpac comes to explaining a conflict of interest is a statement on the About Crowdpac page, “We have raised our seed round of financing from several top tier venture capital funds and angel investors, including NEA, InterWest, Index Ventures, CAA and SV Angel.” SV Angel means Conway, a firm where he is the founder and co-managing partner. On October 16, Crowdpac retweeted a message from Conway, “Join me and vote in the 11/3 San Francisco election. Visit @Crowdpac to see my ballot and create one of your own.” The ballot that a user creates on Crowdpac is seen by the people a user shares it with, but Ron Conway’s ballot is seen by everyone who visits Crowdpac. How is this not hypocrisy, to claim to believe in small donors but emphasize the choices of a big donor? Hi Jay – Crowdpac is happy to answer your questions. Feel free to ping me at mason@Crowdpac.com. Is ping some weird way to tell a person to email you, or is it something else? I don’t think he has any questions, Mason. He’s busy answering the questions raised by this site, namely: how exactly data can be manipulated to influence the voting public. I think this analysis of Crowdpac is an excellent coda to last week’s SF Chron story wherein Conway’s emails to Air B&B staff directing them to vote a specific way to Air B&B staff were leaked. “Join me,” sez Conway. No thanks. Conway and others like him have too much influence over our mayor and this city’s future. In any case, it’s telling that the first response to this excellent editorial is from Crowdpac itself. Write a rebuttal if you like, Mason. But asking the writer of an op-ed to go offline with his concerns by pinging you? Uh-uh. This isn’t an internal matter. Any site that seeks to shape public opinion should be questioned openly (and often) by the “crowd” whose opinions it tries to influence. Rather than offering this writer to ask questions, how about Crowdpac addresses the facts he addresses here. If you want to create a vehicle to influence voters to support your candidate Conway, go for it. But don’t claim to be nonpartisan and objective when you are so blatantly not. Observing how you are manipulating the data lets me know NOT to support Conway, since your bad actions reflect negatively on him. This is fascinating. Civic startups are the new superpacs for billionaires. Ron Conway is also invested and featured prominently in the Brigade voter app, which was founded by billionaire Sean Parker who, surprise surprise, is spending millions on a 2016 marijuana bill.